How are e-Sports Affecting The World Of Sport? e-sport is a term which many people are hearing about, but a lot are still not quite sure what it means. It involves video gaming that is on a competitive and organised level. This particular activity is sometimes referred to as electronic sports. Which Video Games are Part of e-Sports? Not every video game which comes within these categories is classed as an e-sports game, but each of these categories has a good selection of games, that do fall into the e-sports competitions. The basics of e-sports consist of one of the various video games being played competitively and are comprised of several players that will often form teams. Originally, this form of game playing took place among amateurs but has now gone to a professional level. As this grew in its popularity, it meant that a large fan base was forming. Statistics indicate that by the year 2019, there will be a fan base of 427 million spectators who watch one of the many different types of e-sports. This form of video gaming can give the economy of a country a significant boost. For example, in the UK for the year 2016, it was indicated that the UK economy took in close to £20m. It also has had an effect on the gambling industry, by opening up more doors for gambling opportunities. 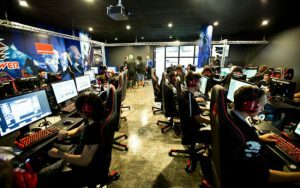 One of the many different ways in which it is able to have a positive effect on the economy is that it provides more opportunity for the workforce, as it encourages the production of more games that can be added to the e-sports list.